Wireless cache uploads, Connect IQ compatibility, Doppler radar, are all new additions that sound pretty exciting to me. Not to mention a brand new interface you can select for activity based uses. Bluetooth, Wifi, notifications. Initial issues upon release seem to have gone way down (albeit not eliminated) since Garmin began focusing on beta testing before release. I know, some users experience more issues than others with existing units. And there is still a smoothing over of issues when new units are released. But, by en large, the Garmin units I own are reliable for my uses and I'm stoked on purchasing a 750. But man, Doppler radar is a game changer. There have been many times I was backpacking and wish I could have the most recent weather information. Seems like most of the new features are cosmetic rather than upgrades in navigational abilities. But cool nonetheless. How does it get Active Weather info? What did they do to improve the antenna? It probably gets weather data via a weatherband radio signal (kinda how the Nuvi and Drive series get traffic data). Unless the GPS satellites can now communicate that information too. Antenna could be shaped / routed differently for less interference with the onboard electronics. None of these are confirmed so take these answers with a grain of salt. The weather radar data and forecast info is received through a Bluetooth connection with your phone OR through WiFi. I often put my phone, connected to a small battery pack, in a ziplock and put it in my backpack. This way I can receive notifications and run a Live Track (and now weather) through the GPS on my pack strap. The ability to automatically upload activity data to Garmin Connect means that you can take the 7xx for a run, hike, or bike, and keep track of your metrics on Connect without connecting to your computer or even thinking about it. If a fenix watch doesn't fit your lifestyle or pocketbook, the Oregon 7xx will pretty much do most of what the watch does in terms of exercise metrics and wireless record keeping. After reading more about the Oregon 7xx, the wireless geocaching feature automatically updates your logs and notes to geocaching.com and refreshes the cache log data already on the unit. No need to connect to your computer for anything geocache related. "Redesigned antenna for better reception"
I can't find any FCC photos of internals. I wonder what the technical details are on this redesign? I think I'll simply use a Phone App for the weather. Rather save battery from the Bluetooth. I use my smart-phone for weather info during everyday life as well. But, when I'm hiking/hunting/geocaching, I have my GPS, not my phone, on my pack strap. I guess the usefulness of the weather data feature will largely depend on how and when you use your GPS. You won't get the Active Weather without your phone. And I assume that also means you need to have a mobile internet connection too. Where I go hiking, I don't get cell phone reception. We know you'll need a Bluetooth connection to your phone for this to work. Where you hike, you won't be getting weather info on your phone either, obviously. To my knowledge, cell phone data is the only mobile wireless technology that will allow you to receive weather radar and forecast. The National Weather System has county alert data that are broadcast via radio waves (see Rino 6xx series) but no radar or forecast on the screen. Weather info via satellite anywhere, anytime, would be ideal on a portable device. But it's not even possible on a phone without data connection. So If I'm understanding the geocaching "Live" feature, it appears as though all you have to do is pan to anywhere on the map (or use current location), hit the refresh button, and the closest 25 caches with log and notes info will download automatically and be saved to the unit. All the caches downloaded can then be refreshed live in the future, whenever you want, even in the field via Bluetooth. Pocket Query download and manual transfer is a relic of the past!? Hardly a "yawn". the 700's spec sheet is comparable to a three year old Casio c811 ($30 eBay) , but the Garmin has a 3"screen instead of the Casio's 4". "Comparable" to whom? I have a Commando and, in my opnion, it's not comparable in the least to any of the latest Garmin units I own. For starters the screen brightness in bright sun isn't comparable at all. Garmin easily wins the screen readability contest despite having a slightly smaller screen. I buy Garmin units for field crews for a reason. Believe me, if we could make due with everyone using their various smart-phones, or buy a $30 phone for everyone (with data plans), it would save us some $$. But for our advanced uses, heavy reliance on maps and aerial imagery, and other needs, not to mention actual tech-specs, Garmin's are still what we require both technically and practically, and probably always will. Sharing waypoint, track, photo, and map data wirelessly between units in the field is just one small example of things Garmin's do that a $30 eBay phone can't. I took the bait. Look, there are countless OTHER threads on the GPS vs Phone debate where people on both sides grind axes. You need a new pony. there is no bait, it's just information. you can share tracks, waypoints, caches, map overlays, image overlays, and even full maps, vector/satellite/etc via wireless just fine. no cellular contract needed, ever. i would totally love to see a Garmin that can share data wirelessly with other devices over standard Bluetooth/wifi/etc, but i don't that will happen with this unit. "i would totally love to see a Garmin that can share data wirelessly with other devices over standard Bluetooth/wifi/etc, but i don't that will happen with this unit." Why don't you think sharing data wirelessly would happen with THIS unit when it's been a feature for years on most Garmin handhelds? Its also in the spec sheet for the 700 series. I'm wondering if Garmin will grandfather in older devices that have Bluetooth functionality (GPSMAP 64s, Oregon 600/650, etc.) to the Geocaching "Live" ecosystem. The new Oregon 700 series looks great, but I sure hope the firmware is stable out of the box. Not only that, but I hope any associated phone apps (such as BaseCamp and Connect) are updated with more functionality. The BaseCamp iPhone app, as it stands now, is pretty spartan and needs work. I've transferred one waypoint at a time between Montanas. did not succeed between Oregon to Montana, or 64s to Montana. those are the only experiences I've had. the few times I've asked others about Bluetooth/wifi transfer of files (a hundred waypoints or ten tracks) between phones(or tablets) to Garmin devices I've not had success, other than powered USB card readers. please, yes, tell me I'm wrong. i would really like to be able to share maps, maps overlay images, tracks and waypoints with friends that have Garmin devices, but my lack of experience with them means i don't know how, and their extent of understanding is "i need my laptop to do stuff". It looks nice and all but $399.00 for the entry level unit is out of touch of reality nowadays. The wireless stuff is cool as ong you have data reception with your phone but then why not use your phone for that cool data anyway? And reception then becomes a problem, if theres no pocket queries on the unit and no reception on your phone then were out of luck! The big issue is the price. This should be a 200dollar unit. Theres nothing in it that justify the 399 price tag except the garmin logo which in fairness doesnt help me find caches in the wilderness. No Oregon is an entry level unit. That is the eTrex line. Why do they still insist on making these screens so small? Even the Montana has a 4" display, it's like they took a step backwards with their latest offering. I just don't get it. I was anticipating their next GPS to have a larger display than the Montana even, but I guess that's not to be the case. Guess I'll stick with my trusty smartphone. An older phone at that, (LG G3) and I love the 5.5 inch display, and the GPS is pretty decent, even in the trees, and I "need" the turn by turn navigation that my phone offers, lol. Not necessarily intending to cast aspersions on the 700, just "wondering out loud" why they designed it like they did, and in hopes that Garmin design team reads this stuff - maybe take the hint & design a new model with the features I (and I'm sure many others) would like to have. They already make models with larger screens. If larger screens (and shorter battery run time) is your thing, get one of them. The Oregon series is still (IMHO) the best series they make, and I can not wait to get my hands on a 750t! I agree. I have the Montana and it is as big and heavy as I would ever want. With all the features on this one I might get the basic. I have TOPO 100K US plus three 24K's plus CN Navigator on a card so won't have to buy new maps. Other than the Montana, which model has a larger screen? I'm interested if there is one available. The battery life is an issue, no doubt, and that's another sticking point for me. I can use my smartphone hard all day and still have 50% + battery left over. Just noticed your subtitle, have to agree. Im rather excited about the new series and Im jumping in. Have my old unit on the auction site and have a pre-order in for the 750. The Oregon line, for me, is the perfect combo of size, portability, and functionality. Others will feel different. There's no best fit for all. I look forward to your well written and informative reports on the 750. I hope you will convince me that the new version of the Oregon is a Big Yes, rather than a disappointing yawn. Only Garmin could try to get away with charging $150 for topo maps. And, if the past is any indication, suckers geocachers will happily pay for it. Neil, as always, spec sheets are only half the story. If the new features are implemented well, I think the 700 series will be a hit. If not, I'll concede and yawn right along with you. It'll be a few weeks before I'm likely to get my hands on a 750. I look forward to posting what I find as soon as I get it. i use open street map and gpsfdepot, and agree, they are very very good maps. just checked the buygarmin accessories lists for both devices. the lists are identical, so even the charging cord is a hold over. I just ordered the 700 which is available now. Should have it in hand by Tuesday. I'll try to post some vids next week. If by other devices you mean Magellan or something like that I didn't see anything to indicate that. It will transfer info between Garmin's but they have had that on devices for a long long time. It does interface with the phone which is nice. If I can run a PQ on the phone and download it to the 700 without using an OTG it is a go for me. Now when I don't have my laptop with me I have to use a double cable since the phone won't power a Montana. With Wi-Fi, I think you can connect directly to the geocaching api without having to go through the phone. Though you will need to run your pq ahead of time. i want to be able to share a file between the Garmin and my phone/laptop/desktop/tablet, wirelessly. no plugging it in, no mass storage mode slaving, just Bluetooth and wifi direct capabilities. i know SOME models could share between each other, but it wasn't available to non Garmin devices like I listed above. that would be awesome. do you have a 6xx series to compare it to? I just want to thank the beta testers who are paying full MSRP to work out the bugs for us so in a year, we can buy the same unit $100 cheaper and have stable firmware. Curious how much of the phone data plan would get consumed with a live connection. Maybe in the US and other places with decent plans, but here in Canada, the land of over-priced and underserved smart phone plans, a $70 a month plan gets you a measly 500 MB of data. My Oregon 600 is less than a year old, so I won't be buying a 700 anytime soon. Speaking for myself, the smaller screen was a pro, not a con. I don't have large hands. The smaller size of the Oregon series as compared to the Montana made it a better fit for me. I have had Oregons for years and can see the screen just fine. Another benefit is not having to replace my rather spendy bike mount. Ordered my 750 yesterday. 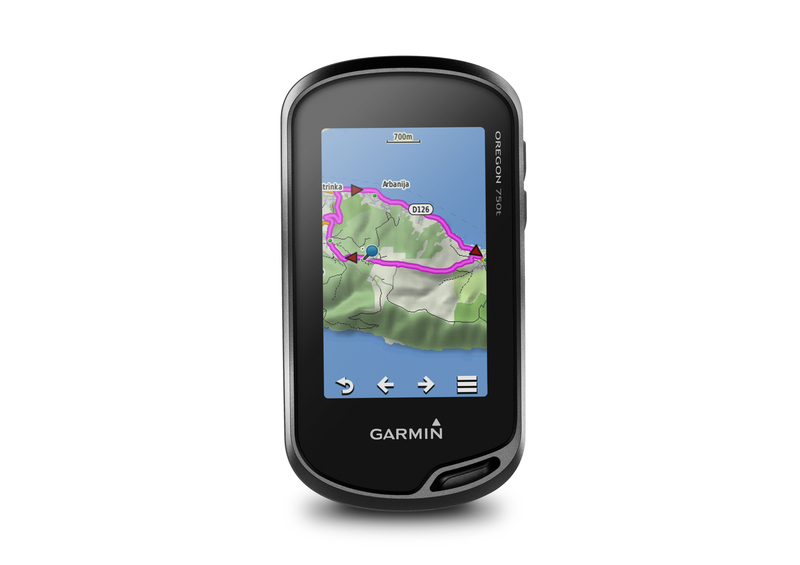 I looked on the Garmin website and it shows that it can't be ordered. Where did you order yours from?